I recently had the pleasure of interviewing Carly one of the owners of Pebbles Café in Seaton, Devon. Carly owns the Café with her husband James. I wanted to get an honest account from them as to what it is like owning and running a Café in Seaton, a small seaside town with a reputation of what some would say is 'run down & lacking investment' - I say some because I for one believe that Seaton is a fantastic place to live and work and is very much an up and coming town. How long have you been here in Seaton now? We've been here now since June 2015, so 4 years. We took over from the previous café owners. So why did you choose Seaton? I am not from Devon and had never heard of Seaton. We were just viewing Cafes in the south, we had seen one in Ottery and this one was our second viewing. James being from fairly local had heard of Seaton, though in his mind the reputation then was not of a very interesting town. On arrival though we fell in love with the charm of the place, it wasn't too over developed, it just felt like a lovely place to be. We walked around the town, we saw the selection of independent shops and the beautiful beach. We just knew we wanted to be here, in a way we knew it was the one even before seeing the physical Café. Do the Seasons effect trade in your Café? Yes, defiantly. 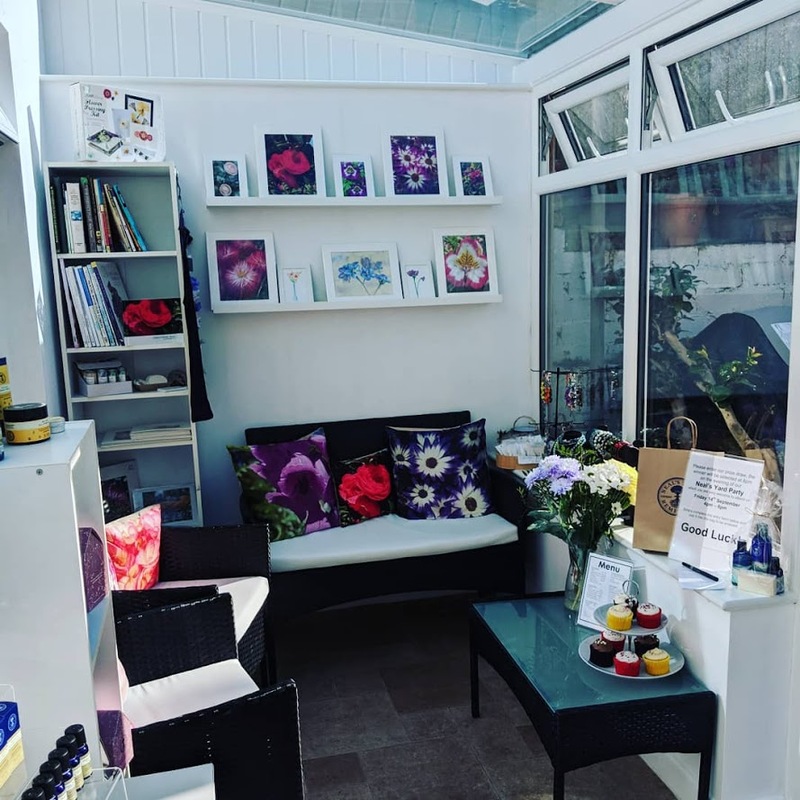 I'd say that our busiest period is July through to September; But we are very lucky to have fantastic local support which means we are able to stay open all year around. If you were to take the locals away in the winter period it would be really difficult for us as although there are a few tourists there wouldn't be enough to keep us going. Christmas can be as busy as summer interestingly, this caught us out initially. I noticed that you are a dog friendly Café? Yes, we are. We made this decision a while ago and to be honest it did get mixed reviews but we found that in the majority it was wanted. Especially in the winter when people are out dog walking and want to warm up with a coffee, they want to be able to come in with their dog not feel they need to sit out in the cold. 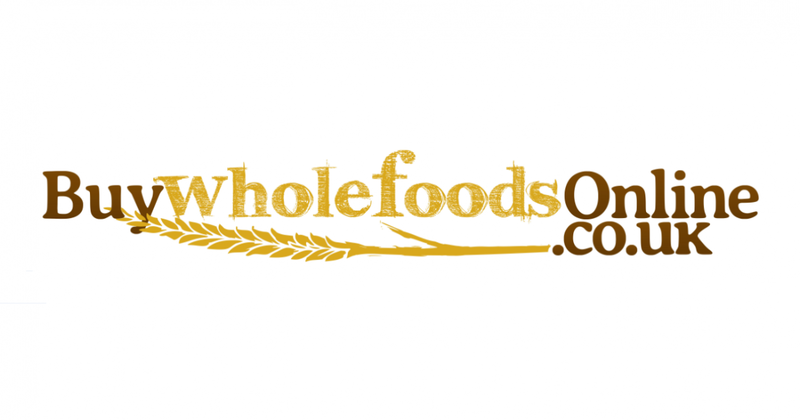 Do you offer things for different diets / health concerns? This is an interesting question as over the years their has been a rise in what is available for different diets. Gluten Free for example is now talked about much more now than it was when I first started as a chef many years ago. We made some very simple changes when we first took over, for example with our chips, they are cooked in a separate fryer and are now all gluten free. So rather than offering a small selection of gluten free separately we chose to open up the wider menu making more things gluten free which is no harm to those who can eat gluten, it still tastes as great it just opens up more options to those who cannot have gluten. We don't get many requests for vegan / vegetarian but I would say that is because we are nearby to a fantastic specialist restaurant that caters for those looking for this really well. We of course are always happy to take requests and obviously have allergen information on hand about all of our foods. If ever a seed of doubt or we cannot be 100% sure we would always ere of the side of caution and say that we couldn't do it, anyone with a serious health condition will appreciate that it isn't something that can be risked. What would you say is the hardest thing about running a Café? Staff management. We are very lucky in that we have a fantastic team of about 12 now - a mix of part time and full time. However managing a large team of staff in a Café isn't easy, we think of our staff as family and so when issues arise it can be hard and in some cases we have sleepless nights about it because we care so much about them but we are obviously trying to run a business too so the fine line can be difficult. Juggling to keep everyone happy is a challenge. Does your Café experience 'trends' ? Occasionally; I wouldn't say as much as other shops / cafes though. Things like the obvious being in October the 'spiced latte' coffee shop trend doesn't really appeal to our clientele. Obviously though we welcome suggestions and always value opinions of our customers. 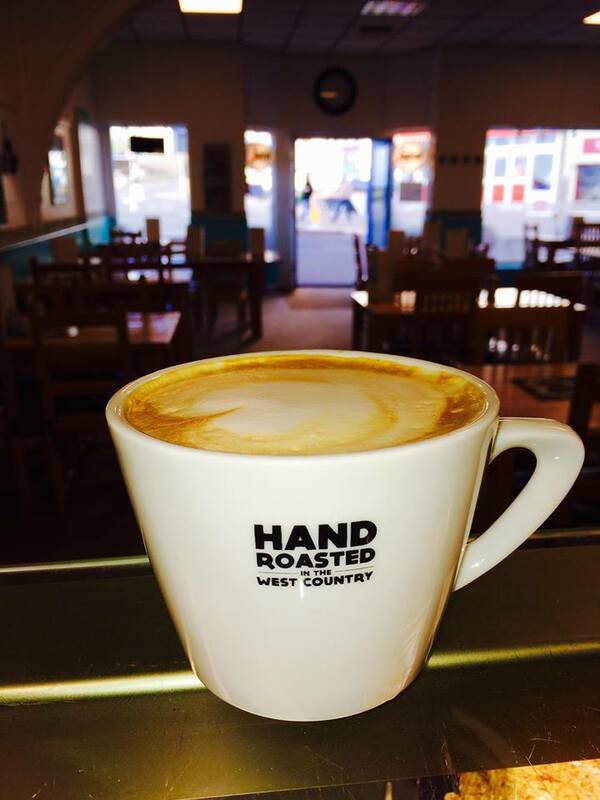 Do you feel you struggle with the competition given there are so many Cafes in Seaton? This question has been asked of me many times, and my response often surprises people. I don't feel we struggle with competition because I feel that all the Cafes in Seaton have something different to offer and we all appeal to different customer bases. We are happy to recommend places to suit peoples needs for example for early opening we'd say trotters, for breakfast with a beautiful sea view we'd say Coast. I've read about your Supper Club, what Is this about? We do Supper club on the last Friday of every month, which is really well attended. 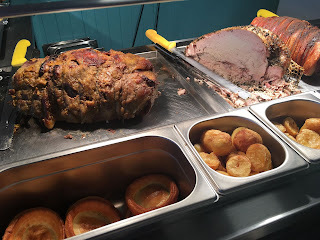 It is almost buffet style and we use the carvery unit to help cater for hot and cold options. We do main courses, desserts and coffee. 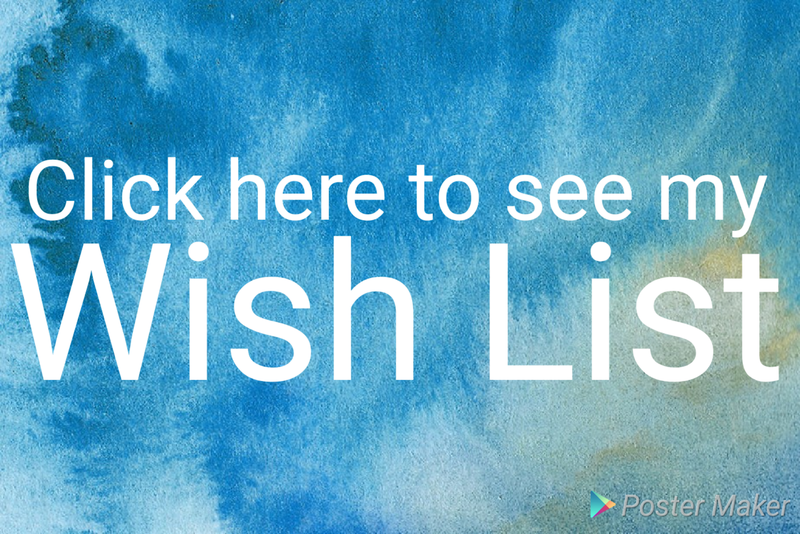 We take on board requests from our customers as to what they'd like to see on offer and this works really well. It is a really lovely social evening and has been a real success for us. I also hear you offer a tasty Sunday Carvery? 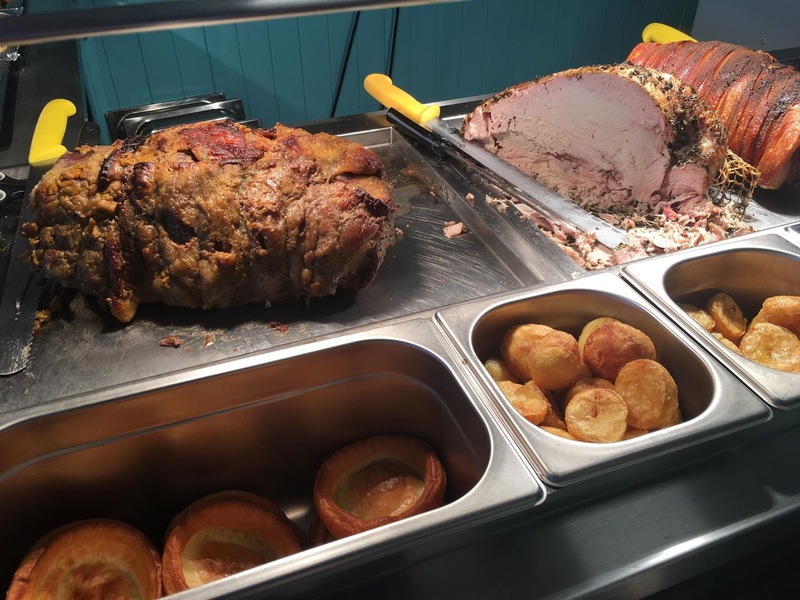 We do indeed, our popular Sunday Carvery is back on Sundays. It is 12-3pm every Sunday. We offer 3 meats and 5/6 fresh veg, it is usually very busy so we always advise people book in for that. Do you yourself shop locally in Seaton? Yes I do, I try to as much as possible personally. I use shops like paperchain for cards and wrapping paper. We enjoy using local eateries when friends and family come to stay like the fish & chip bar, the Chinese and restaurants. I love the Owl & Pyramid, it is a favourite for getting books and toys as presents. I even use other Cafes, I know that sounds strange but sometimes it is just nice to go somewhere different on our days off. Is it hard to run a Café as parents? About one year in to having the Pebbles (earlier than expected) we found out we would be having the family we had always hoped for, a beautiful baby boy. Obviously this was a strain on the business as it meant I had to take time out and that meant more work for James to handle and more hours staff needed to cover. I took around 9 months out from the business, though I did continue working on the background paperwork etc I wasn't able to be in store. 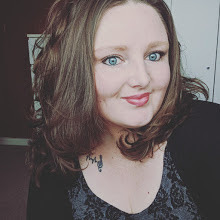 I always knew I wanted to return to work and so when I was ready our son Noah started with a local childminder so I could return to work part time. It can be difficult, but we have a good balance now. What advice would you offer to anyone thinking of opening a business in Seaton? Talk to the town business owners and the locals. You will get a wide range of opinions but it will give you a useful insight into what it is truly like here. Top tips for anyone thinking of opening a Café anywhere in the UK? 2. Shop local - use local suppliers and shop local personally. It helps to build links up and it supports local trade. It is so important to give back to the local community where you can to help it develop. 3. Don't be afraid to adapt - even in the first few months you may need to make changes and adapt as a response to feedback. A big thank you to Carly for taking the time to meet with me and chat, Pebbles is a fantastic Café and very well loved in the community. During my visit there were so many different people in enjoying food and drinks. I saw co-owner James, Carly's husband walking around serving customers and treating everyone like friends. It was such a friendly atmosphere inside and I felt very welcome. Please do pop in to see them, even if just for a coffee and cake (which look so yummy!) If / when you do remember to let them know you read about them here on my blog. Find out more about Pebbles Café here on their website.